December 6, 2014, 11am-4pm. We’re launching our “new baby” – a special store within a store to serve the needs of families with babies ages 0-3. Inspired by the recent pronouncement of the American Academy of Pediatrics that literacy should be promoted from a newborn’s very first days, we are focusing on our youngest customers, offering books and gifts for the nursery. We want to help parents create a book-loving family environment. All are invited to celebrate at The Voracious Reader – 1997 Palmer Ave, Larchmont, NY 10538. (914)630-4581. Come for stories and song, tips on reading with your newborn and more! It’s the most wonderful time of the year: the holiday season in Katonah! And the Chamber is having some special events to celebrate the season. Join us Saturday, November 29th, for Small Business Saturday, a day when, all across America, small communities like ours make a point of supporting the local businesses that anchor our town. Shop early, shop often, and shop local! Also on Saturday the 29th, Santa will be in Katonah, greeting children of all ages. The festivities begin at 11am, behind the Chase Bank in town. Then, on Sunday, November 30th, we host one of the Chamber’s biggest events of the year: the annual Christmas Tree & Menorah lighting. The first 100 people to arrive will receive a swag bag and announce the gift basket raffle winners! There will be singing, friends from the community, plenty of hot drinks and snacks, and warm, inclusive celebrations of Hanukkah, Christmas, and the holiday spirit for all. This year, it’s Katonah for the Holidays! Mamaroneck Beach & Yacht Club’s 2015 Day Camp Fair is Saturday, January 17th from 1 to 4 p.m. The MBYC Camp is a uniquely warm and intimate program of “big camp” experiences specially tailored for campers ages 2-7. The camp includes daily-certified swim and tennis instruction, arts programs, kayaking, water and field sports, music, science, and much more. Please join us on January 17th to register or learn more information. We look forward to welcoming your family next summer! 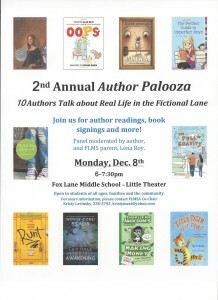 2nd Annual Author Palooza at Fox Lane Middle School. 10 Authors talk about real life in the fictional lane. Author readings, book signings, and more. Panel moderated by author and FLMS parent, Lena Roy. Fox Lane Middle School Little Theater. Open to students of all ages, families, and the community. For more information, please contact FLMSA Co-Chair Kristy Lavinsky 914-239-3752 or kristymaxi@yahoo.com. 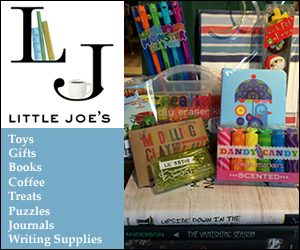 Upstairs in the bookstore, Little Joe’s is the one stop shop for birthday party gifts, stocking stuffers, and boredom busters with books, toys, and gifts. They provide a stopping point for all ages to come in, get warm, cozy up with a book, a smile, a craft activity, or just a run through of the toys which are always out for kids to play with. Little Joe’s is the spot parents come to when they need to get out of the house on a cold day or for a visit to one of the coveted story times to meet up with other parents (Story times: Tuesdays at 11am, Thursdays at 4:30, and Sundays at 11am). This Holiday season, Little Joe’s promises even more ways to build community. On Black Friday, November 28th from 2-4pm, instead of a mad rush of a sale, they will be offering a volunteer activity, “Turn Black Friday YELLOW”. For a $5 donation, families can come and make stockings and cards which will be stuffed with candy, and distributed through the Family Services of Westchester’s Veterans Outreach Program which provides support services to soldiers and Veterans and their families around Westchester County. On Thursday, December 18th at 4:30pm, local legend, Miss Kathy, will be displaying her storytelling skills with a winter story time and craft for all ages. Stories of snowmen, snow days, and winter fun will be featured and we’ll be making snowmen crafts. On December 12th, 19th and 23rd, Little Joe’s will be offering special Holiday hours until 7pm, allowing for people to sneak in those extra hours after work, after spouses are home to watch the kids, or after a hectic day to just be able to stop in for more convenient shopping hours. Little Joe’s hopes to make the Holidays brighter for our community and bring back the joy of finding special gifts for the people you love – whether you’re looking for a favorite classic book, a Hanukkah story, a Christmas tale, a fantastic cookbook for a difficult to buy for family member, or a little toy for the nieces and nephews. Little Joe’s is stocked and ready to help with a recommendation, a smile, and a cheery staff offering to give you a break in the day! Come on in and check them out, you won’t be disappointed. 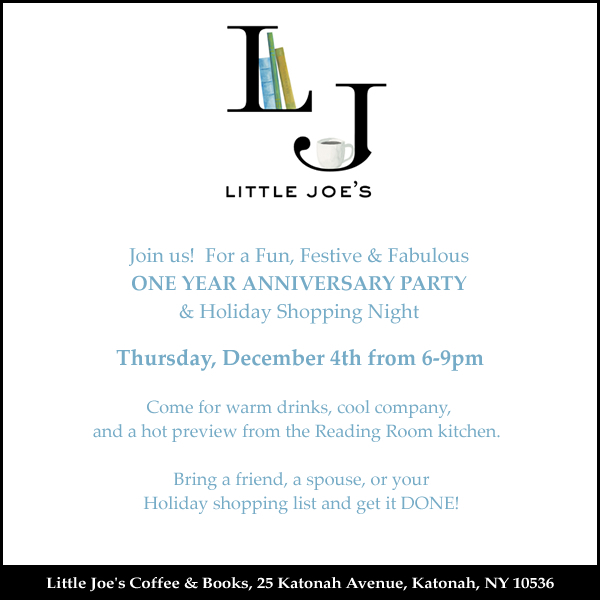 Little Joe’s Coffee & Books, 25 Katonah Avenue, Katonah, NY 10536, www.littlejoescb.com, or find us on social media @littlejoescb. What is the NWH Speaker Series? Get to know Northern Westchester Hospital’s distinguished medical staff as its experts speak on topics that they know best. Learn what the Hospital can do to serve your needs and take control of your and your family’s health and wellness. Enjoy a relaxed atmosphere and educate yourself on topics that interest you and directly relate to your life. The Speaker Series is an initiative of the Northern Westchester Hospital Foundation.